OOH…I CAN’T BELIEVE I MANAGED TO GET OUT OF IT THIS YEAR…NO TURKEY…NO DRESSING…NO ASSIGNMENT…TO WAKE UP THIS MORNING IS INDEED A BLESSING AND A GREAT REASON TO GIVE THANKS.. HOWEVER, IF ONE WERE TO ENTER MY HOME THIS MORNING THEY MIGHT THINK IT ODD. THE ABSENCE OF AROMAS MIGHT GIVE THE INDICATION THAT I HAVE CHOSEN TO GO ON STRIKE FROM THANKSGIVING…WELL, I ADMIT….I HAVE! YEP, THIS YEAR, I DECIDED I WOULD NO LONGER CELEBRATE THANKSGIVING DAY. ONE COULD EASILY ASSUME THAT MY REASON IS BECAUSE I KNOW OF THE ACTUAL STORY OF THE NATIVE AMERICANS AND THE “PILGRIMS” OR THAT I JUST NO LONGER WANT TO COOK. WELL, EITHER OF THOSE ASSUMPTIONS, THOUGH A BIT DISTURBING COULD BE TRUE AND MAY EVEN RING TRUE WITH SOME OF YOU MORE THAN WOULD YOU CARE TO ADMIT IT, BUT THAT’S NOT WHY I’VE CHOSEN TO STRIKE ON TURKEY DAY THIS YEAR AND EVERY YEAR FROM HERE OUT…THE REASON IS FAR MORE SIMPLE, BUT STILL MORE PROFOUND….I’VE LEARNED A SECRET. 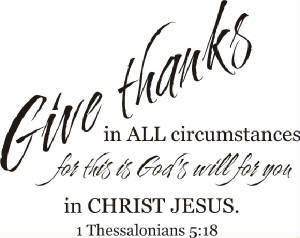 EVERYDAY IS A DAY OF THANKSGIVING!!! I REMEMBER A WHILE BACK SOMEONE DEAR TO MY HEART MENTIONED THAT THEY REALLY DIDN’T PRAY MUCH, BUT INSTEAD JUST SPENT EVERYDAY THANKFUL. NOW WHILE I FOUGHT THE URGE TO POINT A SELF-RIGHTEOUS FINGER AT HIM FOR HAVING DECIDED TO LIVE IN THIS WAY, OVER THE LAST FEW MONTHS I’VE REALIZED THAT HE HAD A GREAT POINT. NOW OF COURSE I’M AN ADVOCATE OF PRAYER, HOWEVER, I HAD TO ADMIT THAT BEING THANKFUL IN ITSELF IS A TYPE OF NON-VERBAL COMMUNICATION THAT SAYS, “I APPRECIATE YOU” TO OUR HEAVENLY FATHER ON A REGULAR BASIS. I’M WRITING THIS LITTLE SOMEWHAT CONTRADICTORY POST NOT TO FLARE YOU UP BUT TO DO THE SAME THING THAT THIS LITTLE COMMENT DID TO ME AFTER I CONSIDERED HIS POINT: RESERVING EACH DAY TO LIVE GRATEFUL INSTEAD OF RESERVING ONE DAY TO “ACT” LIKE I AM. NOW DON’T GET IT TWISTED, I DIDN’T COOK, BUT IN A MINUTE I’M ABOUT TO HIT THE ROAD AND GET WITH MY FAMILY WHO DID SO I’M LOOKING FORWARD TO THE FOOD AND FESTIVITIES THAT THE CELEBRATION OF THANKSGIVING DAY HAS BROUGHT TO OUR COUNTRY OVER THE YEARS. ONLY NOW I’VE REALIZED THAT THIS THANKSGIVING DAY IS NOT WHERE THE GRATITUDE STARTS AND STOPS. 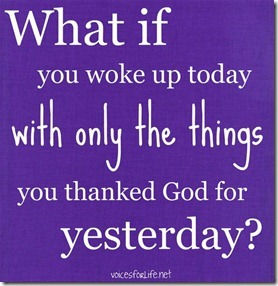 IN FACT, MY GRATITUDE STARTED THIS MORNING WHEN I WOKE UP BECAUSE CHRIST GOT UP FOR MY SAKE SO LONG AGO. SO WHETHER YOU ARE GOING IT SOLO OR SPENDING IT WITH FAMILY AND FRIENDS, I ENCOURAGE YOU TO TAKE THE TIME TO RESURRECT THE RELATIONSHIPS THAT MATTER, REMEMBER TO FORGIVE, AND EVEN FORGET SOME THINGS ON PURPOSE TO MAKE THE FIRST PART A BIT EASIER NOT JUST FOR A HOLIDAY, BUT FOR EVERYDAY. YEP I’M ON STRIKE FROM A HOLIDAY OF THANKSGIVING BECAUSE ONE DAY COULD NEVER BE ENOUGH FOR ALL THE THANKS MY FATHER IS DUE. BE BLESSED FAMILY!